Boil the Lobsters with 1/2 tsp salt, for about 12-15 minutes in medium flame. Clean the boiled Lobster and remove the unwanted shells. Cut the Lobster into 6 slices and drain the water. Marinate with 1/2tsp Turmeric powder. Heat 2 tbsp oil in the pan. Add sliced Lobster and medium fry. Remove the Fried Lobster slices to another bowl. Turmeric powder, cinnamon powder & chilli powder. Stir well. Add Fried Lobster slices, chunky onion pieces and fry for couple of minutes. Add 1-cup water & Salt to taste. Let it boil for 3 to 4 minutes. Garnish it with sliced tomato, green chillies & coriander leaves. Serve hot with any main course. 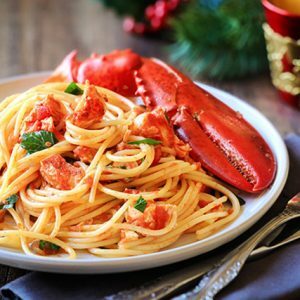 Feel free to comment or share your thoughts on this Masala Lobster Recipe from Awesome Cuisine.